Eldridge Plays and Musicals. 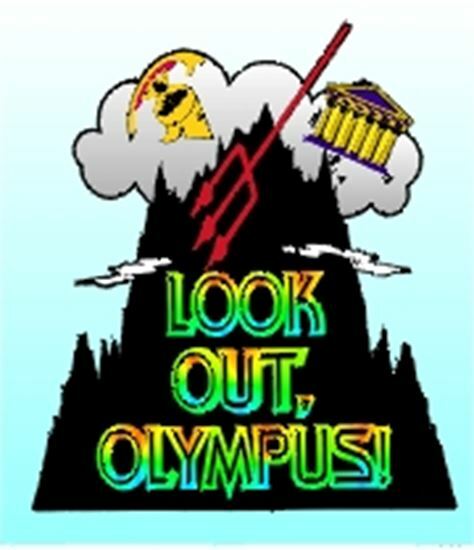 Look Out, Olympus! Ashley, a freshman sprite, makes her first visit to Mt. Olympus to meet the powerful pantheon of gods and goddesses of Ancient Greece. She is overwhelmed by the way the Great Olympians live and the power that they wield, and wants to grab a little of the glory for herself. She becomes friends with Persephone, the goddess of spring who is running away from her brooding husband, Hades. Together the women set off on an ambitious odyssey to steal Zeus' lightning bolts, Poseidon's trident, and Hades' helmet of invisibility and take over Mt. Olympus! They are pursued by the vengeful goddess, Hera, and eventually learn an important lesson about the balance of power. The up-beat score includes a rousing gospel number, "That's the Way It Is"; the bluesy "The Gods Don't Play Fair"; Poseidon's be-bop surfer song, "Go with the Flow"; and Hades' haunting ballad, "Gifts Under the Earth." This musical rocks with mirth, mayhem and myth-adventure!